If a stray meteorite ever took out Rome, they would be able to rebuild it, from the big monuments down to the most intimate viale, by studying the many films shot there. Whereas most cities, when they feature in a film, are only a backdrop, the fabric of the Rome so often plays a full supporting role. They might start with Bicycle Thieves. Then move onto Federico Fellini’s oeuvre, La Dolce Vita and his many other homages to Rome, and continue on to the recent BBC Zen series. The Talented Mr Ripley is an optional extra, for the scenes on the Spanish Steps. But the movie they would study most closely is Roman Holiday. On our visit the image of Gregory Peck and Audrey Hepburn on a scooter was everywhere. Those movies capture the essence of the city, even down to the ear-shattering Vespas (engines exposed for maximum decibel scatter) and straggles of visiting nuns heading for St Peter’s. This walk, www.gpsmycity.com, links up many locations in the film, and takes you down fashionable streets. The most sylish of all must be Via Margutta, full of high-end galleries, where Joe Bradley (Peck) and the real Fellini lived. The city’s great sites, St Peter’s, Piazza Navona, the Forum and Colosseum, Trajan’s Column, Castel Sant’Angelo, the Trevi Fountain, the epic golden statue of Marcus Aurelius, Piazza del Popolo and the others are so close together that you’ll see them all easily in a weekend’s strolling, even if you don’t go in. However no amount of heaving humanity should put you off the Pantheon. We found a gap in the crowd and burrowed into that vast, 2000 year old open space, as the rain fell gently through the perfect circle in the roof. One place where we did manage to dodge the crowds was Trajan”s Column. The feline population you see prancing in the fenced-off excavations are pampered by a doting army of elegant ladies, and protected by law, an inscrutable link with the city’s past. Kittens frolic on the toes of colossal statues. older family members had out. Streetwise toms to sift through choice left-overs outside three star restaurants, and fat tabbies to loll like disdainful empresses on the bonnets of Maseratis up quiet side roads. Another definition of graceful relaxation here, out of many, is afternoon tea in the lobby of the Rome Cavalieri, under Tiepolo’s enormous work Ulysses discovering Achilles among the daughters of Lycomedes. The hotel’s fine art collection, which includes some of Rudolf Nureyev’s costumes, raises this place to a rarefied niche. We stayed on the eighth floor of the five-star hotel, on a tranquil hilltop retreat just west of the Tiber. The city was spread magnificently below us. The idea is you plan your day in this luxury bolthole, then sally forth into the city on the free shuttle bus that runs every hour. You return for luxury pampering in the spa, a refreshing dip in the choice of pools, or a stroll in the lush hotel gardens. We skipped the bus one Sunday morning and walked the mile or so down to St Peter’s where the throng was awaiting the Pope’s 11 AM address, from a window so high up we could barely make out his face. On a quieter day we might tried to see Michelangelo’s Pietà in St Peter’s. But our hotel had already booked an admirable alternative for us. Great works of art are scattered liberally among the city centre churches. You could, for example, seek out the works of thehotheaded genius Caravaggio, whose powerful paintings, startlingly lit against dark shadow, were the movie posters of the 1600s. We had time for Santa Maria del Popolo, for the Conversion of St. Paul (the apostle is flat on his back, arms outstretched); and his St Matthew Trilogy, in San Luigi dei Francesi, close to the Pantheon. One of the most poignant places in Rome has nothing to do with imperial grandeur, or centuries of great art and architecture. It’s where a doomed 25 year old lived his last six months. 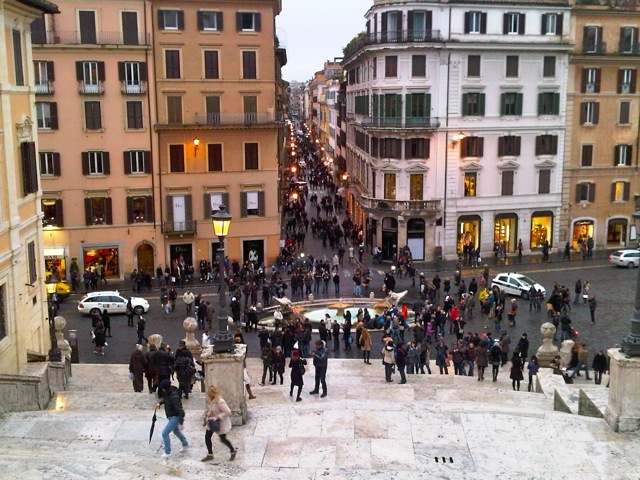 Standing in the room where John Keats died of TB in 1821 was intensely moving, while everyday life continued just outside on the Spanish Steps. Externally Keats-Shelley House is unchanged from when Keats moved here in vain hopes of a recovery, with so much more to say. But his reputation as a great poet was already made (the movie Bright Star tells his story). Everything in this small museum is in English, and there’s an excellent shop. The Landmark Trust rents out the apartment above. One of the joys of visiting Rome is finding my favourite restaurants from way back haven’t changed. Pehaps Monte Carlo, on Vicolo Savell, has a few more photos of Carlo with famous customers, but his prices are still stuck way in the past. How about two pizzas and a half litre of smooth, young house red for a ridiculous €20? www.lamontecarlo.it. At Trattoriia da Giggetto (Via del Portico d’Ottavia they make the fried artichokes and the Filetti di Baccala (cod fritters) just as the Ceccarellis devised it in 1923. you’re unlikely to be disappointed in any small family place in Rome. First time we looked, down a deserted Via Santa Maria dei Calderari, Al Pompiere looked permanently shut, with no external hint they ever sold food there. Checking again the next night, we found a fairytale reawakening, all blazing lights and smiling waiters. Trademark dishes include, from the ancient Roman gourmet Apicius”s recipe book – beef and citron stew. We didn’t find the restaurant featured in the latest BBC Aurelio Zen detective series, set in the city. I suspect the producers want to keep it to themselves. However, I can vouch for the restorative effect of Zen’s favourite grappa, in Cafe Pace (Via della Pace. Our cafe of choice was Tazza d’Oro, by the Pantheon. There was time for one last hectic dash to the final church on our list, Santa Maria della Vittoria. We had just 5 minutes before leaving for the airport, but I’ll never forget that brief glimpse of Bernini’s serene and passionate sculpture in white marble The Ecstasy of Saint Teresa, a minor marvel of Renaissance Italy. Citalia, www.citalia.com, leading Italian specialists, arranged my trip. We stayed the night before flying in the Gatwick Hilton, through HolidayExtras.com, for packages at all major UK airports,with parking.